Gas Companies are Required to Pay Natural Gas Royalties Pursuant to the Terms of Each Landowner’s Oil and Gas Lease. Many Pennsylvania Landowners may have Valid Claims Against One or More Gas Companies for Making Improper Royalty Payments. Typically Claims for Improper Royalty Payments are Based on a Gas Company Improperly Deducting Post-Production Costs, such as Gathering, Transportation, Compression and other Costs. All Landowners must Understand Whether they have a Valid Claim Against any Gas Company for Violating their Gas Lease by Improperly Deducting Post-Production Costs from the Landowner’s Royalty Payments. A critical issue facing Pennsylvania Landowners is whether a gas company paying their royalties is violating their Oil and Gas Lease by improperly taking post-production costs deductions from their gas royalty checks. Typically, boilerplate Oil and Gas Leases clearly permit a gas company to deduct post-production costs such as gathering, transporting, compression, separating, treating, dehydrating, storing, processing and marketing the oil and gas. In the 2010 Pennsylvania Supreme Court’s decision in Kilmer v Elexco Land Services, Inc. et al., 605 Pa. 413, 990 A.2D 147 (Pa. 2010), the Pennsylvania Supreme Court held in part that post-production costs such as gathering, compression, transportation and others are properly shared by royalty owners through proceeds deductions unless the Oil and Gas Lease expressly provides otherwise. All oil, gas or other proceeds accruing to Lessor under this lease or by state law shall be without monetary deduction, directly or indirectly, for the cost of producing, gathering, storing, separating, treating, dehydrating, compressing, processing, transporting, and marketing the oil, gas and other proceeds produced hereunder to transform the product into MARKETABLE FORM; however, any such cost which result in ENHANCING the value of the marketable oil, gas or other products to receive a better price MAY BE DEDUCTED from Lessor’s share of production so long as they are based on Lessee’s actual cost of such enhancements. However, in no event shall Lessor receive a price that is less than, or more than, the price received by Lessee. (Emphasis Added). Lessor’s prorated share of taxes, measured by volume, on the oil and/or gas royalty. (Emphasis Added). Unfortunately, many Landowners with the Market Enhancement Clause and Ready for Sale or Use Clause Addendum terms are receiving royalty payments with substantial deductions for post-production costs. Most gas companies deducting post-production costs under the Market Enhancement Clause and Ready for Sale or Use Clause argue that the natural gas produced under the gas lease is in a ‘marketable form’ or ‘ready for sale or use’ and in ‘pipeline quality’ at the wellhead. Companies conclude that they are permitted to deduct post-production costs, including gathering and transportation fees, from the wellhead to the downstream point of sale because these costs “enhance” the value of gas that is ‘marketable’ and ‘ready for sale or use’ at the wellhead. If your Oil and Gas Lease contains the ‘Market Enhancement Clause’ or ‘Ready for Sale or Use Clause’ and any gas company paying you royalties is taking deductions for post-production costs contact The Clark Law Firm, PC today. Attorney Doug Clark will review your Oil and Gas Lease and royalty statements and advise you whether you may have a valid claim for improper royalty payments. Remember, post-production cost deductions can result in thousands and possibly even millions of dollars over the lifetime of your gas lease. Do not simply stand by and watch the gas company deduct thousands upon thousands of dollars from your royalty payments. Learn your royalty rights today. Attorney Doug Clark is Pennsylvania’s Landowner Lawyer and he takes on gas companies to make sure you get the royalty payments you deserve. Do not get cheated on your royalty payments, learn your rights by contacting us today! iTunes using the button below. The Clark Law firm recently represented my wife and I in our negotiations with SWEPI LP concerning a gas lease in Tioga County. We found them to extremely knowledgeable and helpful in assisting us to reach an acceptable agreement. We would not have been able to successfully conclude our negotiations without their assistance and guidance. 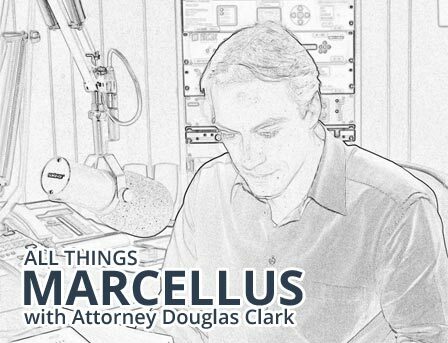 Contact Attorney Doug Clark Today. Tons of people have already subscribed. We would love for you to join us.